Veterinary pharmacists bring a love of animals to a critical role at Cummings School. 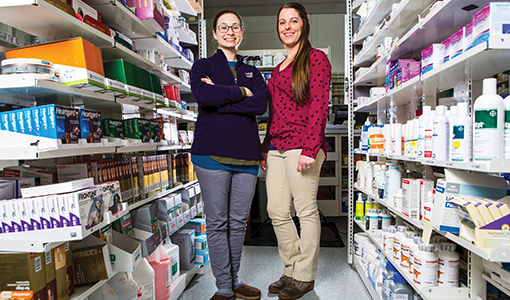 As veterinary pharmacists, Claire Willey and Carolyn Arnish have one of the most uncommon jobs in the nation: They are two of only about 100 specialists working at veterinary schools across the country. At Cummings School of Veterinary Medicine, Willey, pharmacy supervisor, and Arnish, a staff pharmacist, work in a pharmacy that’s open from 8 a.m. to 8 p.m. weekdays and 8 a.m. to 5 p.m. on weekends—at a time that Cummings Veterinary Medical Center’s case load has skyrocketed to more than 34,000 animals a year. Willey, a graduate of the University of North Carolina Eshelman School of Pharmacy, and Arnish, a graduate of the Massachusetts College of Pharmacy, recently spoke with Cummings Veterinary Medicine about how veterinary pharmacy has proved the perfect career fit. Here at Cummings School, veterinarians and clinicians prescribe medications every day. How do you help? Willey: We review and fill prescriptions and are consulted when something new comes up. Often clinicians rely on us to address concerns about drug stability and drug compatibility. For instance: “‘I don’t want to put in another IV. Can I prescribe these two oral medications together?” We are also consulted to puzzle out the best dose. All dosing is weight based—one little movement of a decimal can be an underdose or an overdose. Arnish: I say we’re spellcheckers for doctors. Our job is to make sure they put the script in correctly, that they have the right weight and that the frequency of that drug is appropriate. We do a ton of math all day. We also have to understand drugs in relation to animal metabolisms, what are called pharmacokinetics and pharmacodynamics. We need to know how the animal’s unique metabolism affects the drug from absorption through elimination, and how the drug affects the body—what is its purpose. A newer branch of our field is pharmacogenomics, which is the study of how drugs behave differently in the body based on a person’s or animal’s genes. There are significant differences across all species when it comes to drug metabolism. For example, dogs have a much faster gastric transit time, which means the drug has less time to absorb into the blood stream to exert its effect. How did you both get into the field? Willey: I was always a big animal lover. I was the kid who always asked for a pony—who legitimately asked for a pony!—and never got one. I’m not sure why I didn’t think about becoming a vet, but I didn’t. Then, in my second year of pharmacy at UNC, a guest lecturer talked to us about opportunities in veterinary medicine. I had my eureka moment: That is what I should be doing. Arnish: I grew up in Massachusetts and remember my mom bringing me to the Cummings School open house. I remember it so vividly—the teddy bear clinic and the police dog demo. I said to myself, when I grow up I want to work at Tufts. I always wanted to be a vet, but I am extremely allergic to cats and some breeds of dogs, so I knew it probably wasn’t going to work out. Instead, I focused on health care and picked pharmacy and, like Claire, when I heard about opportunities in veterinary hospitals, I knew that’s exactly what I wanted to do. To come full circle back to Tufts, that’s amazing for me. Do you feel like you’re working in an animal hospital? If so, what is that like? Willey: Any day anyone brings up to the window a cute puppy or, for me, if a draft horse walks by, that’s a great day! Arnish: Our office is located right on the corridor of the Hospital for Large Animals, so we also can actually see the horses being led to their treatment or therapy. Today when I came in to the hospital, I walked by a couple of donkeys. You just don’t get that anywhere else. What’s the most rewarding aspect of the work itself? Arnish: I am always learning something. We always have an open dialogue with the clinicians, particularly around species that we don’t see routinely. Our senior clinicians have the knowledge and experience to say, “Oh yes, I’ve done that before,” and so I am learning from them all the time. We had a script for a 15-pound iguana and I thought, there is no way this animal weighs this much. But it was, in fact, a 15-pound iguana. Willey: I can’t say enough good stuff about my team. Everyone does what needs to be done to make sure that the pharmacy is running well and the patients are safe. On a busy day we might see 100-plus in-patient prescriptions and maybe 75 for animals being discharged home. Some days are slower, but if the ER gets really busy one night, the next day we are doing everything we can to keep up with demand. You don’t really know, one day to the next, what it’s going to be like. We are flexible and roll with the punches—that’s pharmacy in general. What is it like working in a small field? Willey: Everyone literally knows everyone. A lot of the people who started the Society of Veterinary Hospital Pharmacists also pioneered the field—they figured everything out. Today, everybody is very good about bouncing ideas off each other. You also have to be willing to go where the job is. I was born and raised in North Carolina, and if you had told me five years ago that I was going to live above the Mason-Dixon Line, I would have told you were crazy!